From the creator of the Flyboard – a jet-pack-inspired rotating platform designed specifically for the water, champion jet-skier Franky Zapata reveals the Hoverboard. 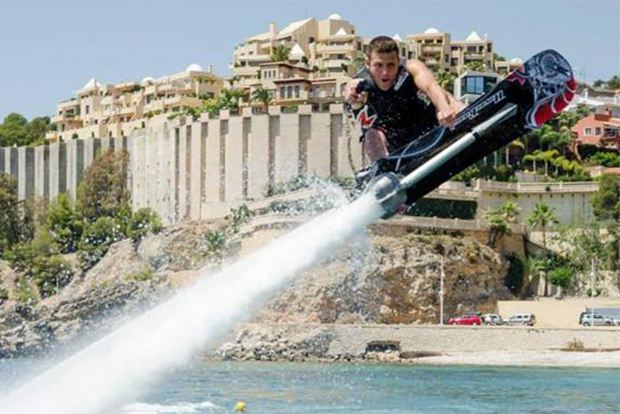 Using the same technology as its predecessor, but with a single slalom water ski, the board is attached to a long hose with a single hydro-jet spewing water at a rate that will send its rider 30-feet into the air doing somersaults and flips on the way down. Priced at a whooping, yet expected $6,000 USD, check out how you could rent or even sell Zapata’s Hoverboard.